For millennia, the Linville River has cut bits of earth away from a 12-mile depression in Pisgah National Forest. 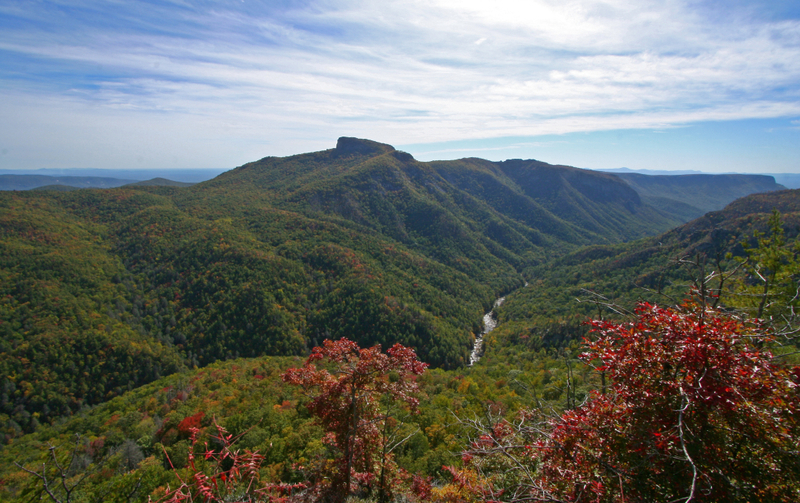 Referred to reverently as the “Grand Canyon of North Carolina” and “the big ditch” by its close friends, the 2,000-foot-deep Linville Gorge is the result of the river’s diligent handiwork. Along Jonas Ridge, which forms the eastern edge of the gorge, skeletal remains of burned-out hardwoods stand as an eerie reminder of the fire that engulfed the area in late 2013. In all, some 3,000 acres burned before firefighters could contain the blaze, which began, as too many do, as an out-of-control campfire. What was left behind was rough, hardscrabble landscape more reminiscent of arid western terrain than the lush woods found in other parts of Pisgah National Forest. A little more than two years later, shrubs and young trees—no more than a couple feet tall—take advantage of unfiltered sunlight, bringing life back to the once dense forest floor. Rock outcroppings on Jonas Ridge provide panoramic views across the gorge. From this opposing vantage point, the western canyon walls ripple in perpendicular undulations, like frozen waves on a brown-green sea. Exploring the improbable terrain along Jonas Ridge means a walk on the Mountains to Sea Trail (MST). 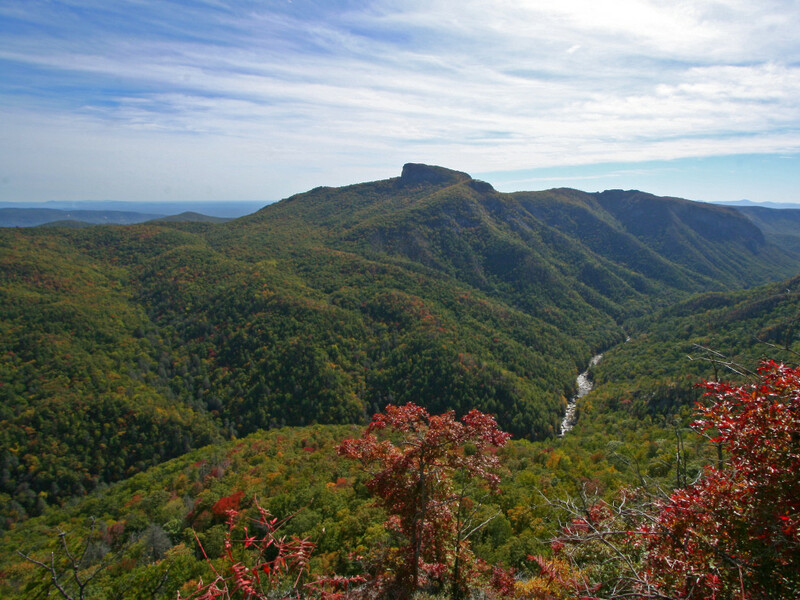 Stretching a thousand miles from the Smoky Mountains to the North Carolina coast, the MST travels mostly north/south along the top of the ridge, forming the trail network’s spine on the eastern side of Linville Gorge. 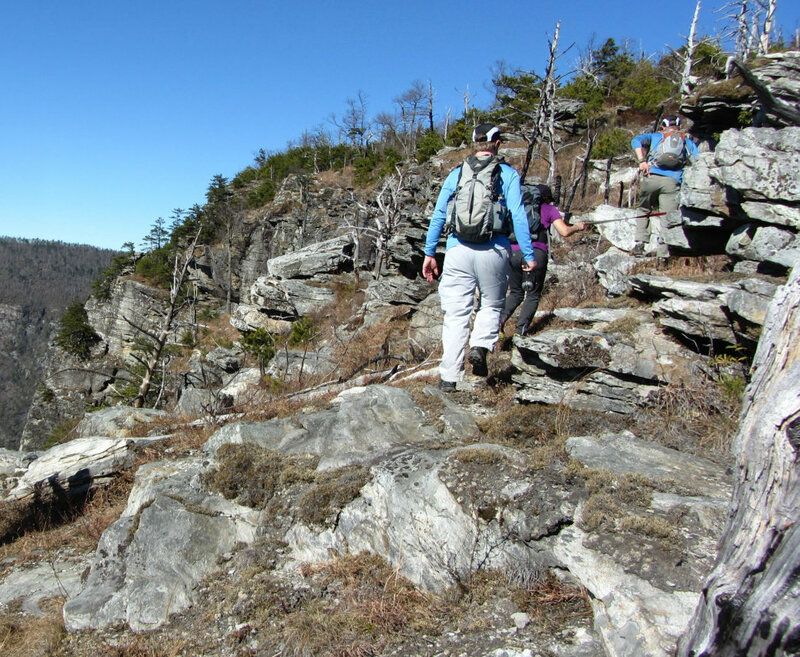 At 1.5 hours from Charlotte, the trailhead at Wolf Pit Road provides easy access to the MST and the southeast section of the gorge. Traveling west to the area on Highway 126, take a right on Wolf Pit. At the end of the gravel road, you’ll find the trailhead and parking area. This out-and-back hike (there are few options for sizable loops in this section of the gorge) does not take you to the bottom but rather rolls along Jonas Ridge. But don’t let that fool you: There’s some rough trail and a few steep sections. Begin the hike with a quad-warming climb up Wolf Pit Trail to the MST. From here, simply turn right (north) and follow the MST to your heart’s content, returning when you’ve had enough. Camp sights dot the trail along the MST and several rocky plateaus serve as first-class lunch seating. After a few miles, the trail dives back into more mature tree cover and the harsh, sun exposed path is traded for a pleasant walk in noon-time shade. There are no facilities at the parking lot and water can be scarce, so plan to carry what you need for your trip. This hike is a great choice for chilly, yet sunny, winter days. The exposed rocks warm quickly and help keep things more comfortable when temperatures dip. As with most hikes, trail conversations in “the big ditch” quickly turn to beer and burgers—your hiking reward. A stop on the way back to Charlotte in Morganton, about 40 minutes from the trailhead, is just the answer. 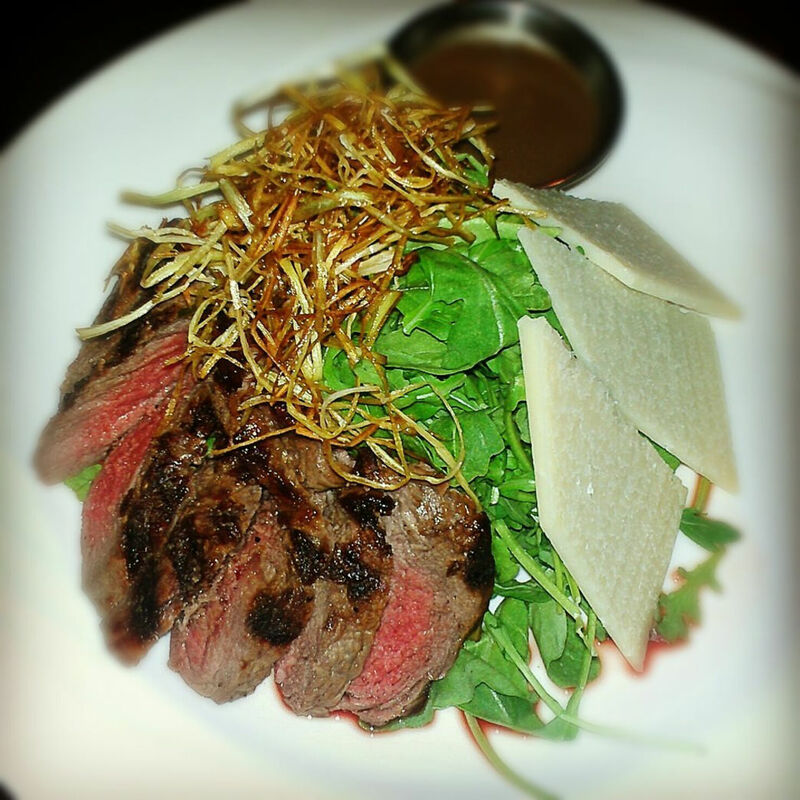 Wisteria Southern Gastropub is a farm-to-fork eatery that blends comfort and authenticity with a bit of flair. Each meal starts with complimentary, homemade cornbread and butter. Everything is made on site or sourced locally, and the seasonal menu includes comfort-food staples like buttermilk fried chicken, Italian sausage and beef meatloaf, and pan-fried Brussels sprouts. The knowledgeable and attentive staff are happy to describe the restaurant's many craft beers, even to a group of grubby hikers. Another bonus: The restaurant is open on Sundays, not a common occurrence in the small North Carolina town. 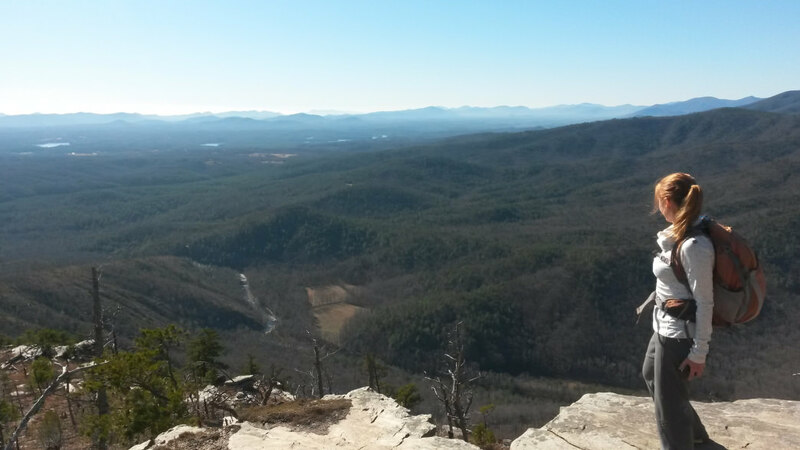 Regardless of when you go, it's a perfect wrap-up for any big-ditch hike (and, just maybe, reason alone to visit this beautiful corner of North Carolina). Want to know more about National Forests? The National Forest Foundation (NFF) promotes the health and enjoyment of the 193-million-acre National Forest System. By directly engaging Americans and leveraging private and public funding, the NFF improves forest health and Americans' outdoor experiences. Since 2008, the NFF has achieved $104 million of it $125 million goal in conservation impact to restore America's National Forest and expand community engagement nation wide. Learn more at www.nationalforests.org.